Explore the great pyramids of Egypt in Egyptian Queen, a 5 reel, 25 payline casino slot by Core Gaming. Pyramids hold some of the world's greatest mysteries. It's down to you to explore the Pyramid belonging to the Egyptian Queen. What will you discover? The meaning of life? Or an incredible stash of gold coins and treasure? The design is fairly simple with the reels set inside a sandy desert scene. There are lots of fun features including a wild treasure feature, Queen's treasure feature and mega multipliers to create dazzling wins. 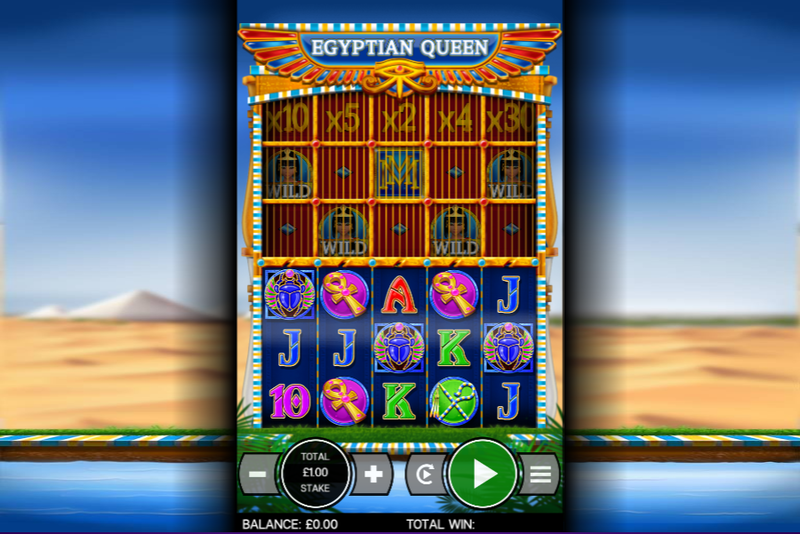 Egyptian Queen is a 5 reel, 25 payline slot created by innovative online casino operators Core Gaming. If you've ever wondered what lies inside the mysterious Ancient Egyptian pyramids then you're about to find out. Put on your explorer hat, grab a spade and get digging! The design is fairly simple. Behind the reels, you'll see a warm desert scene with the sun scorching above. You'll also see many pyramids that are shrouded by mystery and filled with treasure. The symbols include playing card suits A to 10, as well as 3 different Egyptian hieroglyphs. The highest paying symbol is the Egyptian Queen logo which doubles your win when landing 5 on a line. Wild Treasure Feature - At the beginning of this feature, the reels will start spinning. These spinning reels are filled with both wild and blank symbols. The symbols on the main set will then be mirrored onto the bonus reels to reveal a new payout. Reel Treasure feature - During the reel treasure feature, the reels will spin revealing only blank and cash value symbols. All of the cash values that get hit will be added to your total win. Queen’s Treasure feature - The Queen's treasure feature offers extra wilds and multipliers. Landing a mega multiplier during this feature could reward you with a win of up to 100x your total stake. Free Spins Feature - Land 3 or more scatters to unlock the free spins feature. Landing 3 scatters will award you 1x your stake, landing 4 will grant you 10x your stake, and landing 5 will give you 50x your stake. 10 free spins will also be rewarded here. click here to have a look at the promotions we offer! If you love Egyptian-themed slots, then you will enjoy Egyptian Queen. It's not one of the free mega slot machine games but it's just as good. It's a fairly straightforward online game with a nice and simple design and rewarding features. The Queen's treasure feature is the most rewarding, awarding up to 100x your total stake for landing a mega multiplier.